Picture taken from the Public Health Library. Sometimes history gives one perspective to understand the consequences of our actions. I grew up in a world with numerous infectious disease epidemics, in a time before there were large numbers of vaccines available. I was very young, so my memories were of my parents keeping me out of school or away from friends if I had something or they knew an epidemic was flying through the area. I had the polio and smallpox vaccines when I was young, so my parents stopped being worried about them. My father would tell me stories about polio epidemics during the summers of his youth in Upstate New York. I remember thinking that these stories were reminiscent of the same ones where he said that he walked uphill in the snow both ways to and from class. Until I ended up going to a university in Upstate New York, and I had to do that. So I guess his polio stories might have been true. Then as I grew up, I realized that polio was dangerous. I had several classmates who had had contracted polio. One was a friend who had to walk to and from class with two canes. One time, one of her canes broke, and I literally carried her from school to my car, then drove her home, then carried her into her house. Lucky for me, she was small and petite, and I was tall and strong. So, I saw the effects of polio directly as I grew up. I was of the age that was right on the cusp of massive immunizations with the Salk and Sabin vaccines against polio. But it took time for the immunizations to get to everyone, so there were a few who were debilitated by the disease. Kids just a few years older had a higher rate of classmates who were afflicted with the after-effects of paralytic polio. Many died. Many were hospital bound in iron lungs. It was in this world that I contracted chickenpox when I was about 6 or 7 years old. It’s hard to remember all of the details, but I remember a few things. First, I itched like crazy, and my mother would yell if I tried to scratch it. But I also got to stay out of school, so that was fine. Because, when all is said and done, chickenpox isn’t that dangerous of a disease. According to the CDC, before the vaccine was available, about 4 million people got chickenpox each year in the United States. Of those, 10,600 of those people were hospitalized, and 100 to 150 died each year. Those statistics seem small, unless you happen to be one of those who were hospitalized. Again, it’s hard to remember all the details, but I remember feeling OK. Kind of like getting a cold. However, two things happened at the same time that nearly put me in the category of those who died from the disease. The first thing that happened was one of the pox marks, on the back of my head, became seriously infected. At the same time, I got a serious brain swelling (at that time, no one was sure if they were independent events or one caused the other). Within hours, I was dizzy, and I kept passing out. My father was a career military officer at the time, and was of the opinion that “whatever didn’t kill you made you stronger.” Doctors were useful if you had a gunshot wound. But in this case, I clearly remember the concern in my parents’ face as I was shipped off in an ambulance to the military hospital on base. Now everything is fuzzy. I recall laying on my stomach, as several surgeons were inspecting my head talking in secret medical talk (this was the 60’s, so no one was asking for an MRI or CAT scan). Finally, I had to undergo surgery to remove the infection from the behind my ear and to relieve pressure on my brain. Only many years later did I find out how bad the surgery had gone. I was close to death, but I was very young, so all I remember is coming out of anesthesia, and asking the surgeons to show me what they cut out of my head. It was seriously gross, looked like an alien organism had attached itself to me. I lived, which is obvious since I can write this article. All that remained was a 5 cm scar behind my ear. I don’t think about it much until a get a haircut and the barber kind of stares for a few second. Of course, when I was in my early 40’s, I contracted shingles, which is a disease that is caused by the same exact virus that causes chickenpox. The evil virus hangs out in your nervous system, waiting for an opportune moment to strike again. Except shingles is an infection of the nerves, so it’s much more painful (think of pouring hot oil on your skin, and you’d be about 50% of the way to understanding the pain). It attacked me, oddly, in the same place as my scar from the chickenpox, although my doctors said it was coincidental. Ten years later, I made sure I got the shingles vaccine so I’d never experience that again. For most kids chickenpox isn’t awful, although the subsequent shingles is horrible, so there’s that. But if I were 5 years old again, and the chickenpox vaccine were available, I’d be begging for it so that I would have avoided what I went through. Many decades later, I remember the fear in my parents, and the scary smells and screams in the hospital. These are images that no 7 year old kid should ever have in their memory. Vaccines would have saved me from that. This is a guest post from Ken Reibel, from Autism News Beat. My Aunt Maggie contracted polio in 1943, at the age of 17. She was feeling fine, the story goes, when she boarded the bus home from summer camp. During the long ride, she complained that she didn’t feel well. Hours later, when the bus arrived in Detroit, Maggie had to be carried off. She was one of 12,450 cases of polio reported in the US that year. Maggie lost the use of her legs, but escaped the dreaded iron lung. 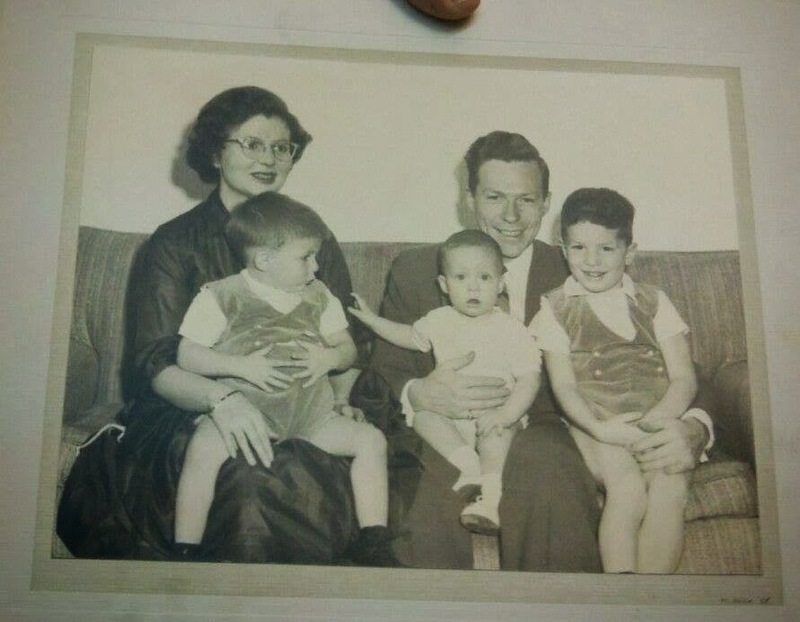 She lived a long life, married my dad’s brother, and gave me three really fun cousins. The family lived in a modest ranch home in a Detroit suburb. My uncle, an electrical engineer for ConEdison, built a wheelchair accessible house with no steps and wide doorways. She did the laundry, cooked great meals, celebrated the holidays, and even drove a car with the break and accelerator functions on the steering column. Maggie seemed to savor the world from her wheelchair. She loved wild birds, and she was an amateur mineralogist. I loved it when she identified the rocks and pebbles I plopped on her lap. “Oh look at that!” she’d squeal in delight. “That’s kyanite! Where did you ever find this?” To an eight-year-old this was like a super power. Every rock, I learned, had a story, and my Aunt Maggie was the story teller. Polio never defined Maggie. She wasn’t one to complain about her disability, but she didn’t take it lightly, either. I learned very early not to play in her wheelchair. “That’s not a toy,” she said. “And you don’t want to spend your life in a chair.” Polio was dreadful, a tragedy that, thankfully, would never stalk my generation, thanks to a great man named Salk. Maggie passed away on a spring day, in her chair, while watching the wild birds in the feeder just outside her kitchen window. She couldn’t have planned it any better. Mary Virginia with her family. Heather’s father is the young boy on the right. Picture estimated to be from 1958. Provided courtesy of Heather, and used with her permission. This story was told to me by Mary Virginia’s granddaughter, Heather. 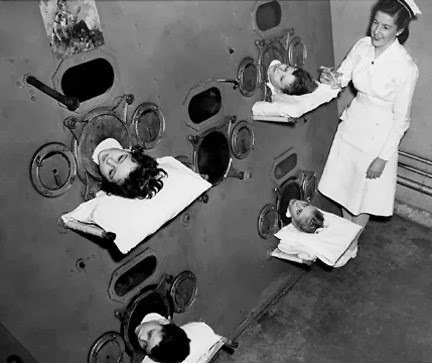 After seeing the picture of the communal iron lung at the top of the blog, Heather realized that this is what her grandmother spent several years in. Mary Virginia was born in 1930, to a well-off family. Her childhood was happy enough, until the summer of 1937. Mary Virginia went to the neighborhood swimming pool, and had a lovely time. The next day, right before bed, she felt a little fuzzy. Her mom touched her forehead: the child was a little feverish, so her mother called the doctor. Within hours, Mary Virginia could not control her lower body; within two days she was in an iron lung, in a hospital. She told her granddaughter that she shared a communal iron lung with four other children at a time (an “Emerson”, she called it). There were dozens of children with polio in the hospital. The turnover was high. Within six months, she and only two others were the only ones left from the original group she saw. In the communal iron lung turn over was fast for a grimmer reason: children died. Mary Virginia stopped counting her lost companions when she reached 24: she didn’t know how to count any higher than that. She had an aversion to the number 24 since then: it reminded her of the children she saw die. After leaving the iron lung she spent additional years in the hospital. Many of the skills she had before she went in were lost and had to be relearned: she was back in diapers, and had to relearn to use a restroom, something that took years; she could no longer walk. “She wasn’t really welcome back to her town,” Says Heather. Getting her life back together was hard in other ways too. While in the hospital, Mary Virginia’s education was patchy. The hospital tried to provide education, but it was not equivalent to what a school would have given. Mary Virginia had to relearn to write (though she kept reading through her hospitalization). She was not allowed to go back to her regular school, and had tutors working with her. It must have been lonely. But she overcame this obstacle too: she got through high school, attended university and taught home economics – cooking and sewing – for years. Her physical development was also impacted. She only grew to 4 feet 8 inches in height. Her doctors were also pessimistic about her ability to have children, and here too she beat the odds, having five children in six years, almost dying while birthing her youngest in an emergency C-section. 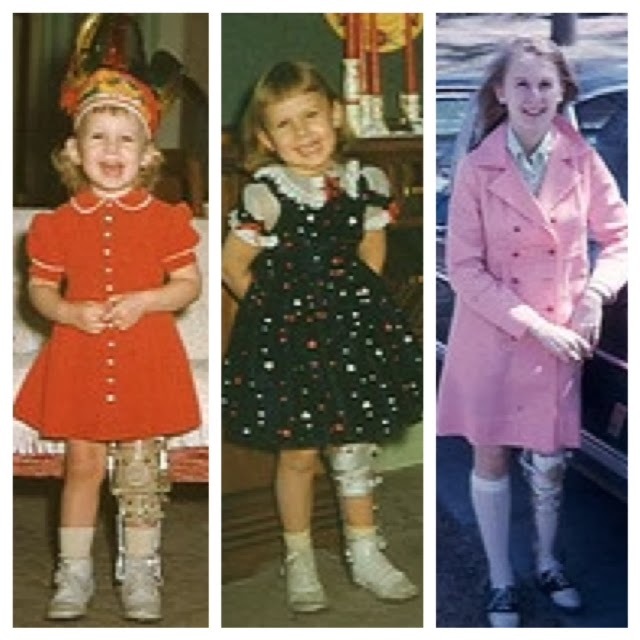 Mary Virginia worked hard to overcome the obstacles polio put in her way. As said above, she graduated from college and worked, teaching until the early 1980s. She and her husband, a lawyer, had five children. She cooked and cleaned every day, rejecting the help of housekeepers as part of her determination to be independent. Cooking was not easy for her, since her short stature – a memento from the polio – made reaching shelves hard, but she persisted, and taught her son and granddaughter how to cook. She gardened, and loved anything “outdoorsy”, says Heather, who remembers her as “strict but very loving.” She stayed friends with one of the women who was admitted into the hospital in the same year she was, someone who could identify with her experiences. In June 2003, she died. Her family misses her keenly. But Mary Virginia built a good life for herself, in spite of obstacles, and Heather is grateful for having had this remarkably, brave woman in her life. Acknowledgements: I am grateful to Heather for sharing her grandmother’s story and to Alice Warning Wasney for her comments and help with the draft. 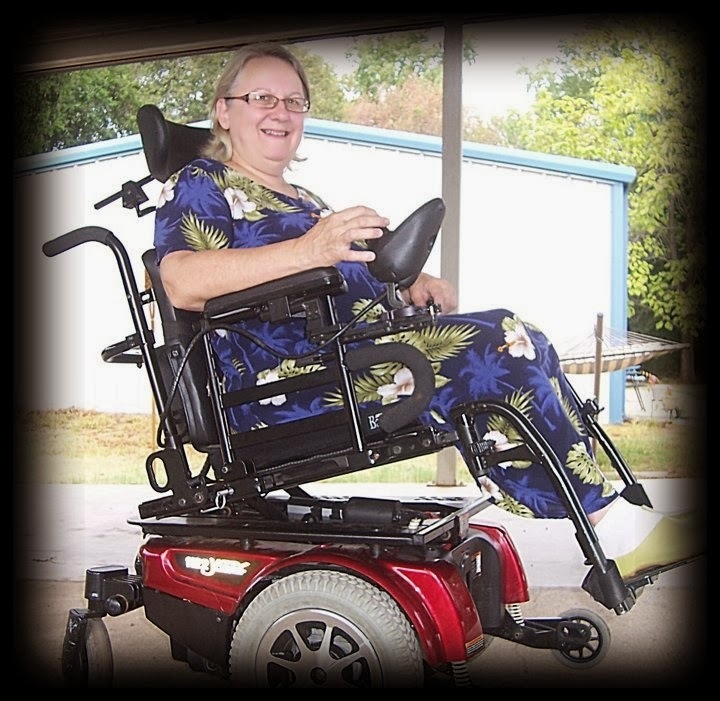 a new condition – Post Polio Syndrome continues to affect its survivors. 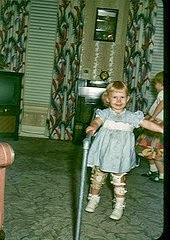 Mary was two when she contracted polio, in 1954. Mary as a child, at different ages. Picture provided by Mary, and posted with her permission. Mary with her braces. Picture provided by Mary, and posted with her permission. Mary refused to let polio slow her down. Her dad was a lawyer, her mom a homemaker and she had two older sisters. Mary went through the regular public schools, learned to swim, and rode a bicycle. She graduated from college, and met her husband, a loving and creative man. She worked as a Montessori teacher in preschool and elementary private schools, riding a bicycle to and from work! Mary more currently. Picture provided by Mary, and posted with her permission. She appreciates her husband’s devotion and constant loyalty, through change after change: “He married me with my leg brace, and stayed with me as PPS put me in a wheelchair. Some of us found very supportive spouses. Others, I have learned from my on line support groups, had spouses who left as soon as Post Polio began affecting them”. In 2005, she lost this wonderful man who supported her through all the changes. But she was not alone: her younger daughter, just graduating from college, moved in to be with her, teaching Spanish in a nearby high school. Then, her daughter found a wheelchair accessible house, and the two moved in. Last year, that daughter married and moved out, though she and her new husband live nearby and Mary sees them often; but Mary’s older daughter, widowed and mother to a child, moved into the wheelchair accessible house to help Mary out. The family is very close. Acknowledgements: I am grateful to Allison Hagood for introducing me to Mary, to Mary herself for sharing her story and helping prepare it, and to Alice Warning Wasney for commenting on a draft.